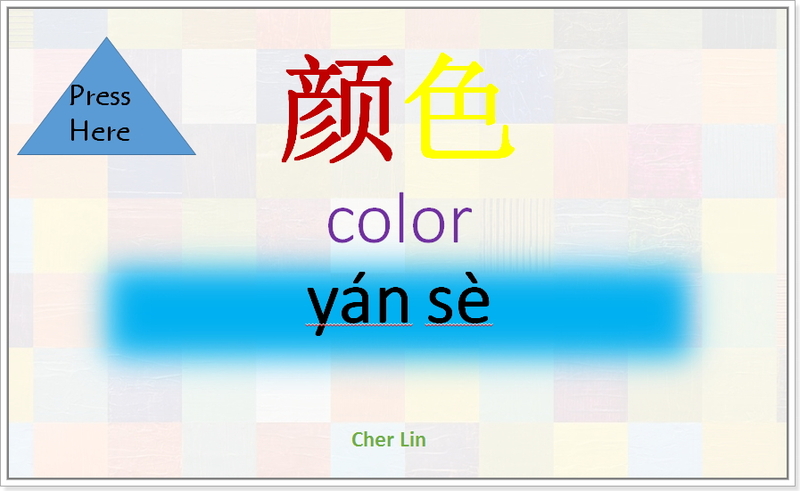 Color/颜色/yán sè: Click on each Character for the Stroke Order. Māma mǎi yì duǒ (yí shù) hóng sè de huā. Mom bought a (a bouquet of) red flower(s). Wǒ chī yí ge lǜ sè de píngguǒ. I ate a green apple. eg.他穿一件橘色的衬衫。/Tā chuān yí jiàn jú sè de chènshān./He wears an orange shirt. eg.王小姐穿一条蓝色的裤子。/Wáng xiǎojiě chuān yì tiáo lán sè de kùzi/ Miss Wang is wearing a blue pant. eg.她戴一顶黄色的帽子。/Tā dài yì dǐng huáng sè de màozi. She puts on a yellow hat. Lǐ tóngxué jiè yì zhī hēi sè de bǐ/Classmate Li borrowed a black pen. eg. 你用一台灰色的电脑吗?/Nǐ yòng yì tái huī sè de diànnǎo ma？/You are using a grey computer? eg.我女朋友拿一盒棕色的巧克力。/ Wǒ nǚ péngyou ná yì hé zōng sè de qiǎokèlì./My girl-friend took a box of brown chocolate. eg. 我朋友挂一个白色的球。/Wǒ de péngyou guà yí ge bái sè de qiú./My friend hung a white ball. Zhè ge bái sè de qiú hěn tèbié。/This white ball is very special. eg. 1: 林老师看一本紫色的书。/Lín lǎoshī kàn yì běn zǐ sè de shū./Teacher Lin is reading a purple book. eg. 2: 那本紫色的书很有意思。/Nà běn zǐ sè de shū hěn yǒu yìsi./That purple book is very interesting. eg. 姐姐想要一双粉红色的鞋。/ Jiějie xiǎng yào yì shuāng fěn hóng sè de xié. /My older sister is thinking to have a pair of pink shoes. Fěn hóng sè de xié hěn piào liàng 。/Pink shoes are pretty.